Move-in ready uptown condo with reserved covered parking. 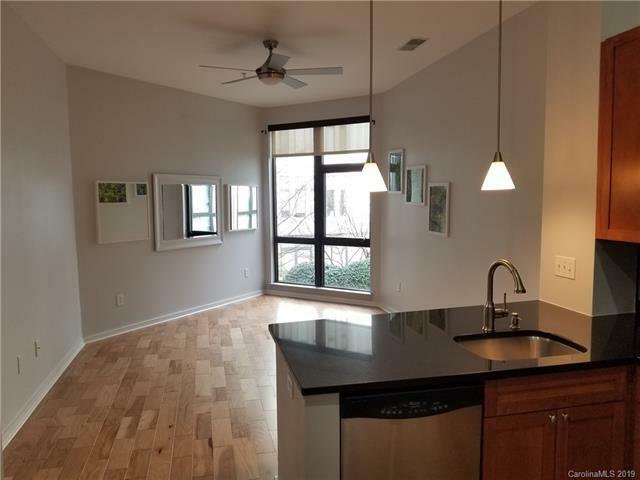 Own this sparkling clean condo for less than rent and enjoy being within walking distance to Spectrum Center, First Ward Park, Epicenter, UNCC Uptown and the Lynx Light Rail. Many recent updates include hardwood flooring, remodeled bath with tiled shower and installation of high efficiency heating & air system ($6,200) in 2017. The kitchen features granite tops, tiled backsplash and shaker cabinets. Entertain in the courtyard amenity area. LG washer and dryer, as well as refrigerator, are included. Low HOA fees for uptown and water is included! Google Fiber is now available advertising speeds up to 1,000 Mbps. Absolutely, the best value in uptown and ready for a quick close! Visit http://northtryon.org/ for exciting changes and vision for the area.